Most of the commercially available rice flour bread contains wheat gluten. So people with wheat allergy could not consume the bread. In the case of rice flour bread without gluten, a thickener or starch was generally added to increase the bread volume. Alternatively, manufacturing the bread required special equipment. The Food Research Institute, NARO (NFRI) in collaboration with Hiroshima University has developed a technology to manufacture gluten-free 100% rice flour bread from basic ingredients such as rice flour, water, dry yeast, sugar, salt and butter. No additives or special equipment is needed. We can make the bread by using commercially available home bakery (for mixing) and oven. By using rice flour with less starch damage and by devising the fermentation/baking processes, we have succeeded in making a rice flour bread with a specific volume of 4 mL/g or more which is comparable to that of wheat bread. Detailed technical information will be provided to collaborators under patent licensing. NFRI is now engaged in improving the quality of the bread for the practical applications. It also eyes the gluten-free global market. This gluten-free 100% rice flour bread will be a good news for those with wheat allergy or celiac disease. It is also expected to expand the consumption of rice. Fermentation and baking of bread. In the newly developed technique, the batter swells to a specific volume of 4 mL/g or more during fermentation. The high specific volume is maintained even after baking. 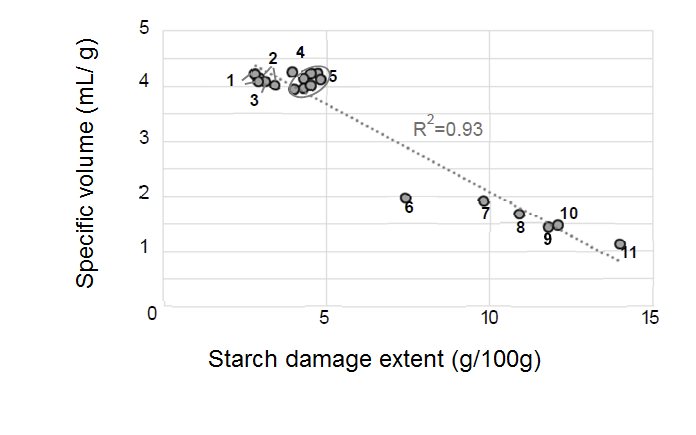 Specific volume of breads against the starch damage extent of the flour. 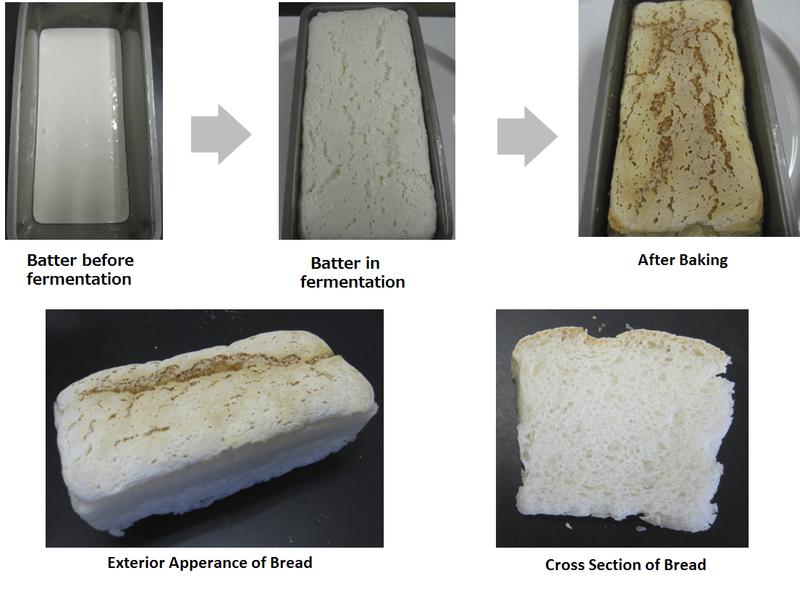 Using rice flour with a starch damage extent of 5% or less, the newly developed fermentation / baking process produces bread with a specific volume of 4 mL/g or more. Eleven kinds of rice flour were tested. Explanatory diagram of the swelling mechanism. In the Pickering foam theory, starch granules are hypothesized to stabilize the interface between the fermentation gas and the aqueous phase. An optical microscope image of the fermenting batter shows that air bubbles are closely surrounded by the starch granules.